Assassin’s Creed III DLC Dated – The Tyranny of King Washington comes February 19 – Plus, Trailer Video! Remember how George Washington went mad with power and crowned himself king, prompting a native american assassin to use his totemic powers in a one-man war against his tyranny? If not, shame on you – you should have paid more attention in history class. But don’t fret – Ubisoft has announced the first of a series of DLC their critically acclaimed Assassin’s Creed III, where you can re-enact these events and learn a little thing about America’s founding in the process! Edutainment has never been this fun! Some more details and some video after the cut. 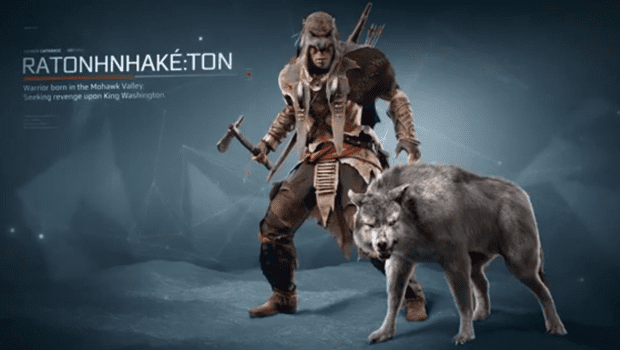 In the shattered reality of The Tyranny of King Washington, the events that shaped a young Mohawk warrior into the heroic Connor of AC3 never happened thrusting a confused Ratonhnhaké:ton into a sometimes torturous, yet occasionally blissful, waking dream. The revolution was just the beginning, Assassins! You know, at first I thought that : being in the name was a typo, but no, they have that right in the video so it’s entirely correct. Really, for those of you who love Assassin’s Creed – and judging by how popular the game is, there’s an awful lot of you out there – this one looks like it could be a lot of fun. Best of all, look at that absolutely ominous, kind of psychotic looking George Washington. Really, I don’t even have this game, and I feel like picking it up just in the hopes of eventually going mano y mano with that guy.